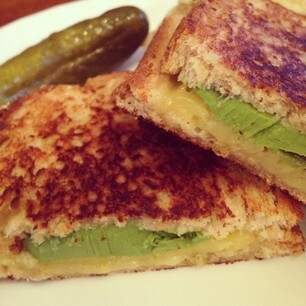 I would never have thought up to add avocado to my grilled cheese sammy. Must try this! Your version is so pretty! Cheese and raspberry jam. Delicious. 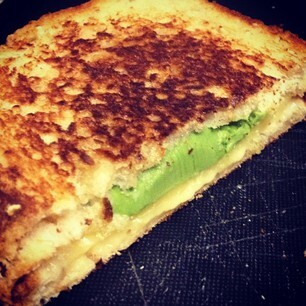 I've never tried avocado in grilled cheese, this looks good. I love chevre grilled cheese on rye, or bleu grilled cheese on olive bread. Mmmm. YES please. Why haven't I thought of this? Not only is avocado a new thought, I have never grilled Gouda. Sounds so creamy and good. Looks like a yummy combination. Have a great week. My fave grilled cheese? Probably smoked mature English cheddar, a bit of crisp bacon, and roasted red peppers. Oh man, this is making me so hungry for a midnight snack. 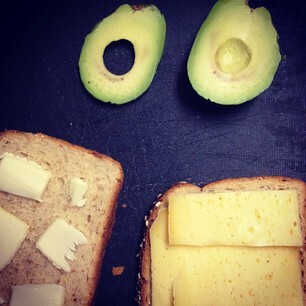 Oooh, I love cheese sandwiches, with avocado and sprouts. Great use of a mixture of cheese as well. This is not cheating-this is lunchtime love. I hope you are having a grand time at KidLitCon-would love to be there sometime! Some of my favorite foods there - I love gouda and avocado! Cheese and avocado is a fantastic combo. Yum! This looks incredible! I'm going to try it this week.